India is known to be the home of textiles, crafts and culture. Right from the beginning of its civilization, India has blessed the world with the best of its exquisite art forms of textile. ‘Kalamkari’ is one of the oldest forms of textile art which has never gone out of style and blends into all kinds of eras. Being so exquisite and beautiful, it gives an elegant look and grace to the fabric. The process of making is complicated, meticulous, time-consuming and demands an extremely creative mind. The Birth: Kalamkari art holds 3,000 years of history. It is believed to be born in Persia and India. It was born in the ancient era of India to transcribe Hindu mythology. 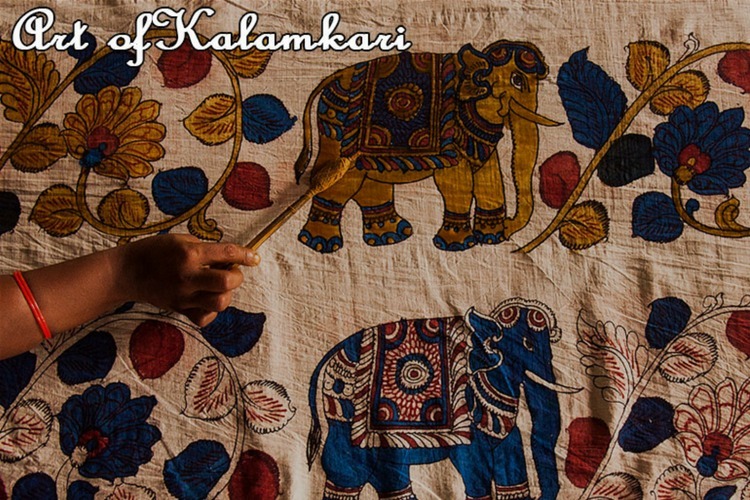 Kalamkari is named after the way it is made that is, ‘Kalam’ / ‘Qalam’ meaning pen and ‘Kari’ meaning ‘Art/ Craftsmanship’. The major production hubs of Kalamkari are in Machilipatnam, a small town situated in Andhra Pradesh and ancient town Srikalahasti located in Chittoor. About Tools, Dyes and Raw Material: The tools used for making Kalamkari art is a specially crafted pen made from the Bamboo tree. Kalamkari artists use this pen to draw textures on the cloth. This texture is very detailed and time-consuming as it is handmade. The dyes which are used in Kalamkari are also exclusively created by various minerals salts of iron, tin, leaves, roots of plants, crushed flowers. Alum is added in the making of natural dyes and for treating the fabric. Innovative Patterns: With its extensive demand from all over the world, Kalamkari has always amazed the world with different patterns and its innovative designs. Its patterns mostly involve designs reflecting Hindu mythology, religious symbols, Persian motifs etc. The Process: After the weaving process is done on the cloth, the fabric is dipped in the mixture of natural dyes and milk. The Kalamkari artists then use the pen made of Bamboo trees to draw the different textures on the fabric. Tips to take care of Kalamkari Clothes: Kalamkari fabrics are handmade hence they need special care when it comes to washing and maintaining. Kalamkari fabrics should not be treated like a normal fabric or to be cleaned in washing machines. While ironing such clothes, it should be ironed from the reversed side of the printing in order to maintain the quality of the pattern. Thin cotton fabrics should be soaked in cold water and washed with mild detergent.